The funny thing is, I am nowhere near as geeked up as I should be, less than 48 hours before kickoff. And I don't really know why that is. Is Ohio State just too damn good? I mean, at the end of last year I had zero doubt that they were going to kill Notre Dame, and they continued to do just that. In the Tressel years, I feel almost spoiled. The sick feeling that just tugged at the back of my mind before Michigan games in the past (see 1993, 1995, and the worst of all, 1996), just isn't there anymore. It damn sure was in the fall of 2002, and the 5 weeks leading up to the Fiesta Bowl may have been the most stressful, anticipatory sports weeks I can ever have. The game was so good, the very definition of an Instant Classic. But that's not the reason they're going to win. Number Ten is the reason. I never thought anyone would eeeeever replace Eddie George as my all time favorite football player--but all of a sudden Troy Smith comes from fighting for time with Justin Zwick (I wasn't impressed in the only HS game I saw him in) to playing Superman in two straight Michigan and bowl games. The one throw I remember, a perfectly thrown ball over a receiver's shoulder--that's the moment I knew. 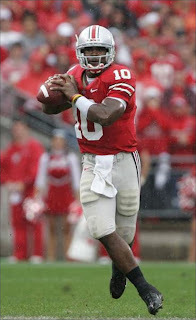 Let's just say I hope Charlie Frye has to battle Troy Smith for a starting spot by the middle of next year. The man makes incredible play after incredible play, and never fails to surprise me. War if the Cavs can finish one off, and the Tribe and Browns can put it together...this may finally be the golden age of Cleveland sports that Sam predicted. War the most boring Heisman ceremony ever. War Scouts Inc. picked Michigan so they can look smart after an upset. better than the ones in 2000 and 2004. War Ted Ginn not stutter stepping when he catches the ball. War sleeping in a bubble. War I almost cried frozen tears listening to Cie Grant sing Carmen Ohio and I hope it happens again. War Ohio State 37, Michigan 13. Touchdowns for Pittman, Gonzalez, Ginn, and a little Brush High alum named Roy Hall. And 300+ yards for Troy. And finally, War me not jinxing the whole f*cking thing.